Athenaeus (c. late 100’s into 200’s AD) was a very learned Greek writer and rhetorician. His Deipnosophistae (Philosophers at Dinner) is a fascinating ancient survival containing the conversations of a group of Greek literate people invited to a banquet. They talk of culinary things and other historical and literary stories about outstanding people and events still living or who had lived centuries before their first century AD Greek banquet. 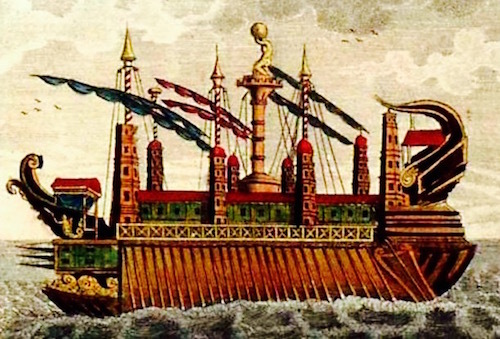 One such topic was a ship called the Syracusia built c. 240 BC and designed by the famed Archimedes for King Hieron of Syracuse (died c. 215 BC). 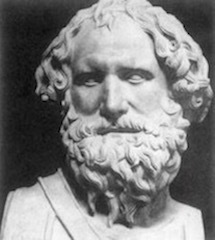 Archimedes (died c. 212 BC) was very famous in his time and, hands down, the greatest “Renaissance” man who ever lived. Athenaeus states he got all the information about this legendary ship from the writings of Moschion aka Machon: “Moschion writes as follows.” Deipnosophistae 5.3. Nothing by Moschion has survived the tramp of history. But it is, nevertheless considered to be an accurate description through Athenaeus of this most amazing ship in the ancient world. Almost. Archimedes (left) had boasted to King Heiron that he could move anything, could solve any mechanical problems by principles he had discovered. The King challenged him to build and to launch into the water the biggest and the best ship ever. After all, Archimedes had stated about the principle and power of the lever: “Give me a place to stand, and I shall move the earth.” (Pappus of Alexandria, 290-350 AD, Synagoge, Book VIII). 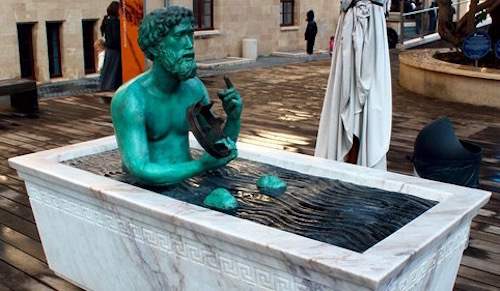 The great Greek mathematician and inventor was bathing either in his own bath or in the public baths when he discovered the Principle of Buoyancy (weight of displaced water=weight of object in air=weight of object in water). All of the “quotes” parts in this article will be from Athenaeus’ book Deipnosophistae 5.3. 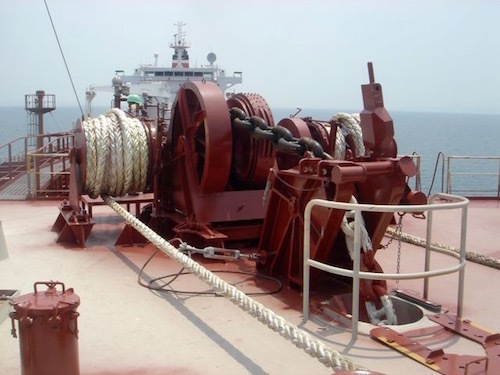 Windlass—“a type of winch used especially on ships to hoist anchors and haul on mooring lines and, especially formerly, to lower buckets into and hoist them up from wells.” Archimedes used his principle to launch the Syracusia from land into the sea. The astonishing floor mosaics with scenes from Homer’s Iliad were in all the rooms reserved for passengers on the second floor deck of the Syracusia. 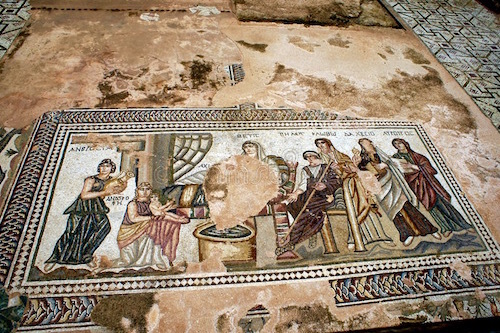 Those mosaics are one of the first mentions in literature of an entire floor mosaic. It took 300 skilled artists one whole year to execute them. “….Built next to these was a shrine to Aphrodite large enough to contain three couches , with a floor (mosaic) made of agate and other stones, the most beautiful kinds found in the island; it had walls and ceiling of Cyprus-wood, and doors of ivory and fragrant cedar; it was also most lavishly furnished with paintings and statues and drinking-vessels of every shape. 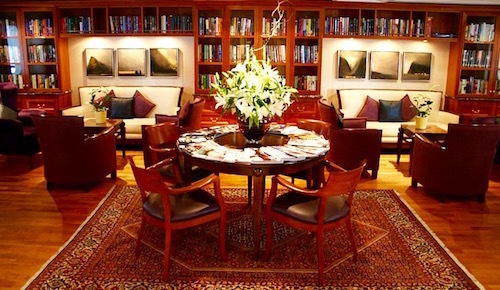 “….There was also a bathroom, of three-couch size, with three bronze tubs and a wash-stand of variegated Tauromenian marble, having a capacity of fifty gallons. (Our modern tubs hold c. 70 gallons of water. )…There were ten stalls for horses on each side of the ship; and next them was the storage-place for the horses’ food, and the belongings of the riders and their slaves….There was also a water-tank at the bow, which was kept covered and had a capacity of twenty thousand gallons; it was constructed of planks, caulked with pitch and covered with tarpaulins. 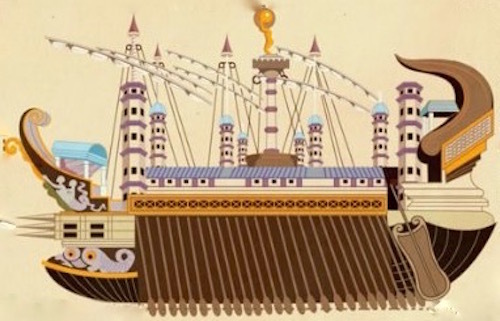 By its side was built a fish-tank enclosed with lead and planks; this was filled with sea-water, and many live fish were kept in it.….Outside the interior, a row of colossi, nine feet high, ran round the ship; these supported the upper weight and the triglyph, all standing at proper intervals apart. And the whole ship was adorned with appropriate paintings. The Archimedes Screw (below), as it is called, is a machine for raising water or removing water from the hold of a large ship. Perhaps this previous sentence from Athenaeus’ book is when Archimedes first invented and used that screw? The Syracusia sailed from Syracuse to Alexandria, Egypt where it was presented as a gift to the Ptolemaic Pharaoh and named the Alexandria. 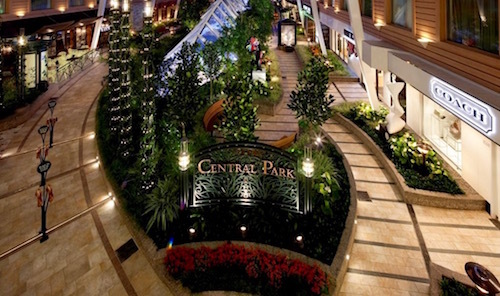 What must the royalty and wealthy who sailed on the Syracusia to Egypt have thought? Imagine they were as stunned by that ship as they were stunned by Egypt’s pyramids and Sphinx who were constructed several thousand years before Archimedes’ ship was even conceived.